If the Department of Homeland Security is defending the homeland, who is defending us? Whether or not our country is actually under attack, our capacity to reason certainly is. Like never before, politicians today are trying to manipulate the very way we think. Our capacity to reason is under siege. Politics is no longer about managing competing interests or about conservative or liberal principles. It is about triggering our flight-fight-freeze reaction. It is targeting the part of the brain (the amygdala) that influences memory, decision-making and, above all, emotion. Adolf Hitler and his close colleague Hermann Goering were masters at this strategy. On the witness stand at the Nuremberg Trials, Goering described exactly how politicians manipulate the citizenry by stimulating strong negative or positive emotional responses. Once these emotions are triggered, Goering concluded, “it is easy” to turn an independent citizen into an ideological clone. • Show us the grieving wife of a fallen soldier at the State of the Union address. As tears stream down her face and she looks toward heaven, we have a strong positive reaction (care, tenderness, “love”). Show us a twice-deported illegal immigrant who returned and killed an American citizen, and we have a strong negative reaction ( anger, blame, “hate). • Want to make us hate NAFTA? Just tell us a story about steel workers in northeastern Ohio who lost their jobs because of that trade agreements. Want to make me love NAFTA? Then just tell me about a single mother at one of the export-based manufacturing plants in Georgia that depends on free and unfettered international trade. • Trying to convince voters that President Trump is right about immigration? Then show them a picture of a grieving father of a son who has killed by an illegal. Want voters to be against Trump? Then introduce them to upstanding, attractive young Dreamers who were born in this country and now are being threatened with deportation. Real leadership is just the opposite of this partial, and partisan, style of persuasion. Genuine problem-solving and policy making requires caring about both workers who are hurt and helped by NAFTA or by our immigration policies. Only when we see the full picture as completely as possible can we make sound decisions. Although it is unrealistic to keep emotions out of politics altogether, it is essential that they not be allowed to destroy other faculties. Democracy depends on harnessing the full range of human intelligence in the service of sound decision-making. This is more relevant now than ever. Triggering strong “positive” or “negative” emotions to determine policy is inherently misguided. When the amygdala is “hijacked,” as Daniel Goleman explained in his breakthrough book Emotional Intelligence, it undermines the neocortex, the higher reasoning part of our brains. As both conservatives and liberals become more entrapped in their own media “bias bubbles,” they become captives of the reptilian parts of their brains. When I design retreats for Members of Congress or their staff, we intentionally engage the full range of human capacities. At these retreats, we don’t create fear; we build safety. 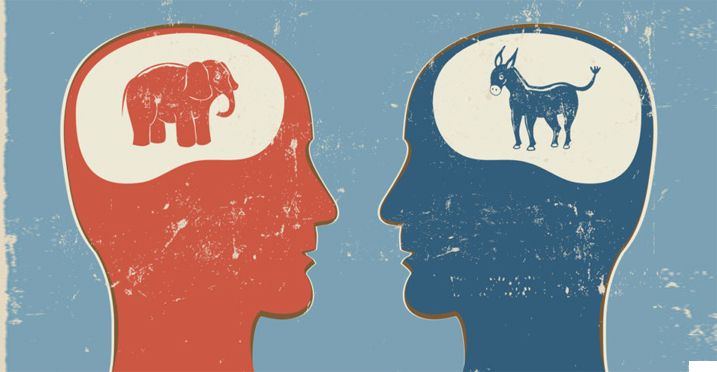 We don’t polarize through debate; we analyze through dialogue. Instead of manipulating raw, conflicting emotions, we raise emotional intelligence (EQ). The result is a properly functioning amygdala, and a greatly activated neocortex. Then we bring competing sets of facts to the table and invite bothsides to form cross-the-aisle teams to engage in thoughtful, tough deliberation. When all the miraculous faculties of the human being are engaged, and multiple perspectives can confront each in an environment of mutual respect, we have the capacity to face any crisis and meet any challenge. But doing so requires discipline — not only of the mind, but of the heart. The next time someone tugs at our heartstrings, let us remember that Thomas Jefferson and the other Founding Fathers believed that the common sense of ordinary citizens was the foundation of democracy. Let’s not just protect our borders. Let’s defend our brains. Mark Gerzon, president of Mediators Foundation, is the author of The Reunited States of America; How We Can Bridge The Partisan Divides.